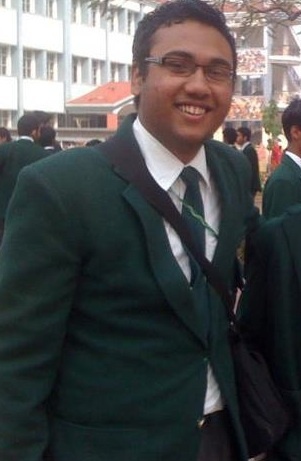 Aditya Sircar is a 2nd year student in B.A. course with Economics (Hons.) in the St. Xavier’s College at Ranchi. In the company of his parents and grand parents, maternal grand mother, aunt and uncle and younger brother, he had been recently to Andamans and has depicted his experience in a mail to me. While going through the same, I was as if seeing the serene islands in my eyes! My journey to the Andamans was rewarding. Rewarding in the sense that I had experiences that one can hardly expect in towns and cities where we live. The serene islands with their elegance and the beauty of nature without much human interference has a charm of its own. The pollution free atmosphere and the greenery around is enchanting. The blue waters of the seas are so clear that you can clearly view the underwater sea life and corals up to a few feet. Life there is much simpler and one with nature. The local people rely on agriculture and other farm and fishing activities for sustenance. The lack of industries is a boon as the environment remains free of pollutants and thus nature blossoms in full swing. There is Asia’s largest and oldest saw mill called Chatham Saw mill located in the seas. Our journey to the three islands located close to Port Blair was a wonderful experience. The ruins of British establishments in Ross Island, the Death chambers of Viper island, and the splendid water sports facility at North Bay with its beautiful beach are marvelous! How I wish I could have explored more…. Away from the hustle and bustle of daily life, its a beautiful respite for those who seek a getaway from their boring and tedious lives. Monuments like the Cellular Jail evoke strong nationalist sentiments. Our freedom fighters who were tortured by the British in that monstrous edifice, died there in the hope that their nation would one day be free of foreign rule. Their sacrifices have made the place holy for every Indian. I salute our heroes! Then there is the beauty of Mount Harriet. The view from the National Park at the top is just heavenly! The beautiful valley stretching vast into the sea is a wondrous sight to behold! Its an out of the world sight! Such views cannot be experienced anywhere else in India. My father rightly said, ” One should meditate in such places.” (about Mount Harriet) Truly the presence of God and his wondrous creations are revealed when one gets to see the beauty of nature. A lighthouse was visible at the very end of the valley on the sea shore! I felt for the first time that I have been blessed indeed that I could visit such a place in this lifetime. In the morning the view was even more beautiful with the sky covered with clouds and mist descending upon the sea….It churned up emotions of joy from the deep recesses of the soul. Oh! What a wonderful sight it was! Traveling to the various places feels less and less tiring as one experiences such beautiful things. Another wonder of nature is the Havelock island with its gorgeous beaches. Radhanagar beach is truly Asia’s best as reported by the TIME magazine. The view of the island jutting out into the sea on one side and the beautiful greenery on the beach side was nothing short of awesome! People were basking in the sun and enjoying all kinds of water sport activities. During monsoon and early winter, Green Sea turtles lay eggs here! Snorkeling at Elephant Beach and Red Skin Coral island was a first time experience and that too an exhilarating one! One can experience the under water sea life and the best part is that you don’t need to know swimming at all! Thus everyone- from children to the old, can enjoy this sport. Racing on a water scooter was even more enthralling! I performed stunts that I couldn’t have imagined I could do. Maybe its the magic of the place which instilled such spirit into me. Swimming was also great especially in the Gobindanagar beach right in front of the Forest Rest House at Havelock, where we stayed. The visit to the Red Skin Coral island was another great experience never to be forgotten. The view of the beautiful corals on the sea bed was awe inspiring! Snorkeling in the beautiful waters and getting close to the underwater life was just awesome! I could touch the various types of corals and even sea flora like sea cucumbers and could sea the beautiful fishes of all kinds while snorkeling! We traveled by glass bottom boats which have magnifying glasses fitted in the middle so that one can view clearly the underwater flora and fauna. The islands have rich flora and fauna. We saw deer and antelopes at Ross island! They are beautiful creatures and thrive in the greenery of the islands. Such exquisite natural environment is rare to see as today’s cities have become concrete jungles which lack vegetation and are simmering in heat from global warming! Thus the journey to these ‘Jewels of the Sea’ was a lifetime experience for me. The islands also possess unique places on earth like the Snake island, full of all kinds of sea snakes, consisting of 9 varieties of such snakes which are not found anywhere else on earth! There is also the North Sentinel island which houses the only stone age tribe present today on earth called the Sentinelese. This tribe has remained totally cut off from civilization for over 60,000 years! Very little is known of these people! While other tribes are becoming extinct, these people mysteriously have thrived and increased in number and also managed to survive the 2004 tsunami without any external help! No one goes around this island as the tribesmen shoot arrows and kill oncoming foreigners! Its really awesome to think that such a place exists in our India which is indeed a wonder on earth! There is also the Barren island which has India’s only active volcano constantly emitting smoke! I loved every moment of our trip. Even the sight of the islands from the window of the airplane when it descended was marvelous. I indeed wish to visit again maybe in the future and would ask all to visit this wonder of nature!